Eden & Haiku Woods is a unique tropical community of 87 townhouse units designed by renowned architect, Norman Lacayo, who also designed Harbor Court in Honolulu. The community is in close proximity to Windward Mall, all of the central business district of Kaneohe, beaches, and parks. This secluded property is completely surrounded by beautiful lush landscaping and is one of Kaneohe's best-kept secrets. The amenities include: swimming pool, wading pool, whirlpool and two saunas. Additional Features and Amenities Located in the most private area of the Eden with tropical forest views from every room. 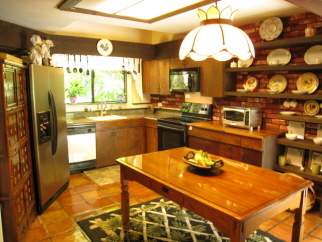 Spanish tile floors, country kitchen, bay window reading nooks, upstairs lanai & downstairs patio, soaring open beam ceilings with sky lights and majestic views of the Koolau Mountains. Feels like a spacious resort cabin and is located just 20 minutes from Honolulu. Two covered parking & lots of guest parking.